It’s just about lunchtime and I’m wondering about how people are fairing on their fare this Fat Tuesday. Traditionally, Fat Tuesday is the day of feasting before the fast. Days before Fat Tuesday, food establishments such as restaurants and even grocery stores market to consumers with slogans of indulging in great feasts. Usually these attempts slide off of me…that is until this year. Yesterday while perusing my Facebook page, I saw a Fat Tuesday posting from my local Whole Foods; it was a photo of a once familiar Fat Tuesday indulgence…the paczki. 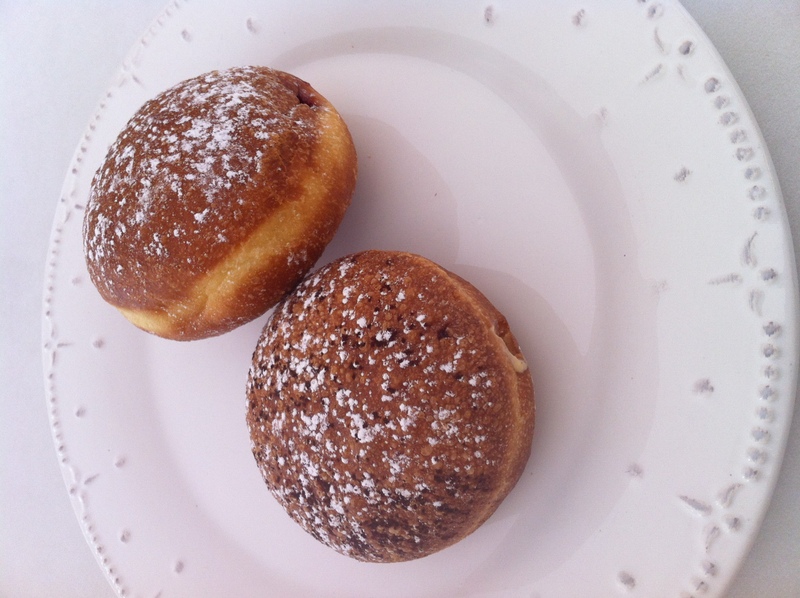 Paczki and Fat Tuesday have special meaning…a special place in my heart…a memory bringing up good feelings. My father was Polish and every Fat Tuesday he and I would drive to Hamtramck, wait in the long line outside of the Polish Bakery on Joseph Campau, get our box of dozens of paczki with custard, prune, and raspberry fillings, and then eat several at his kitchen table drinking coffee. We’d talk about which one was our favorite but mostly it was about spending time together…just talking. Since living in the Twin Cities, I’ve never had a paczki. I’ve never even seen them here so, to see the Whole Foods picture got me thinking about getting some. Then the awareness moment occurred. How was the potential of eating paczki inline with my mindful eating for wellness? I’ve been eating mindfully for quite some time. For me, mindful eating includes how I feel while eating, what I’m eating, and why am I eating…I have removed some foods because I don’t feel well after eating them. I’ve also become aware of eating because of tradition as well as eating a particular food for a few days in a row and then step on the scale and Yowza! I’m also getting back into running after an injury so, I’m very conscientious about what I eat. Yet, those round filled delicacies still tugged at me. Buy me, Buy me, just BUY ME! I had an internal dialogue going on, “Deb, you haven’t had one of these in 17 years…come on…just have one!” But I struggled. Again, it was all about the why am I wanting to eat one of these? Did I miss being part of the Fat Tuesday-Everyone-is-Doing-It craze? No. Then what was it? Was it, eating because I’m bored? No. Did I want to on some covert level sabotage my fitness program? No. Honestly, blowing my eating is inhaling a bag of Finnish or Australian red licorice. That’s the truth. Even my kids know this! My awareness…which is being truthful, honest, and accepting in the present moment was all about missing my dad. True. So, I decided to buy 2 paczki; one filled with custard, and a second filled with raspberry. I still wanted to be mindful of my mindful eating and wellness progress, so I cut each into quarters and told myself that if while eating if I didn’t feel well, I’d stop eating and eat no more. Mindful eating has many components; one is being aware of food immediately after it’s in your mouth. This paczki had a familiar smell but the texture was off. As I chewed, the flavors were the same and yes, a flood of memories came to mind. All happy. As I ate my second quarter, my stomach started feeling funny. Whenever I eat something that disagrees with me, my stomach feels strange. I cannot describe but I recognize the sensation. So, I stopped eating. I didn’t finish that last piece. Another component of mindful eating is being aware of satisfaction; this is the moment of “I’ve had just enough or enough.” It’s the “our amount” that says, I’ve eaten to the point of being satisfied. Going over this point, people feel “full” or “busting at the seams” when eating. Taking it even further is the awareness moment when a person realizes, “Oh my gosh! I ate the entire box/bag/thing!” Even further, people can feel physically ill and even have critical thoughts. It’s been over an hour since I’ve had my pieces of packi and my stomach still feels funny. I’ve drunk a lot of warm water and in another hour will have lunch. So, what did I learn from today’s Fat Tuesday mindful eating of a paczki? I learned that tradition, memories, and love have a lot to do with what we eat, why we eat, and how we eat. It’s the awareness – the authentic awareness of the answers of the what, why and how to ourselves that will keep us on our path of mindful eating and living, or create a detour. I experienced both. And what I want to point out is that a detour is temporary. I know this time next year when seeing paczki, I’ll still think of my dad and those fond memories of Fat Tuesday, but this time I’ll skip eating a paczki as mindful eating is now a way of life. I’m still exploring what that means but for now, I know it means “no paczki.” Instead, I’ll stick with what I know makes me feel good – both physically and mentally. So, on this Fat Tuesday while folks indulge in the feast – give mindful eating a try. Pay attention and be aware of your what, why, and how. Authentically answer these questions to yourself. See what happens. And remember, you can still enjoy and participate – mindfully! What do you think about this? Does mindfully eating make a difference for you – if so, how? As always, I welcome your comments!